Reconstructing three-dimensional tissue structures has been a challenge for quite some time. Fortunately, the development of the scaffold-based tissue engineering approach that regulates key cellular events such as cell proliferation and matrix synthesis and delivers these engineered cell/material constructs to the sites of tissue defects, has come as a reprieve for many in this field. During scaffold fabrication, the creation of pore space is generally considered to be an important process which may facilitate nutrient accessibility and waste disposal in later cell cultivation stage, and has therefore been widely used in various tissue engineering fields. Presently, the scaffold design in a variety of gelatin-based cryogel formats is available in the scientific community. Recent studies have also demonstrated that multicomponent and responsive cryogel matrices can be reproduced to fabricate biomimetic cellular scaffolds, reflecting the importance of cryogel processing to endow the materials with multi-functionalities for tissue engineering. Nevertheless, up to date, the development of gelatin-based cryogels for ophthalmic applications is yet to be reported. Recently, a team of researchers at Chang Gung University in Taiwan and led by professor Jui-Yang Lai developed a new biomaterial of gelatin/ascorbic acid cryogels for corneal keratocyte carriers. Consequently, they hypothesized that the introduction of varying amounts of ascorbic acid molecules into the gelatin materials could affect the structure, property, and function of cryogel matrices. Their work is currently published in the research journal, Acta Biomaterialia. The research method employed commenced with the cross-linking of gelatin and ascorbic acid blends using carbodiimide via cryogelation technique in order to fabricate the cryogel samples. Next, they characterized the cryogels by determinations of total phenol content, functional groups, cross-linking index, porous structure, mechanical and biological stability, and in vitro and in vivo biocompatibility. Finally, the effects of the ascorbic acid content on cell culture performance was investigated and the antioxidant activity, the therapeutic efficacy of cell/cryogel constructs for corneal stromal repair examined by intrastromal implantation in alkali burn-induced model of corneal injury. The authors observed that the hydrophilic ascorbic acid content in the carriers significantly affected the cross-linking degree and pore dimension of cryogels, thereby dictating their mechanical and biological stability and ascorbic acid release profile. The researchers also noted that the cryogel carriers with low-to-moderate ascorbic acid loadings were well tolerated by rabbit keratocyte cultures and anterior segment eye tissues, demonstrating good ocular biocompatibility. Additionally, the cytoprotective activity against oxidative stress was shown to be strongly dependent on ascorbic acid release, which further determined cell culture performance and tissue reconstruction efficiency. Li-Jyuan Luo and colleagues study presented the successful development of gelatin/ascorbic acid cryogels for keratocyte carriers in vitro and in vivo. Experimentally, the cryogel samples were fabricated by blending of gelatin with varying amounts of ascorbic acid and carbodiimide cross-linking via cryogelation technique. Generally, it was observed that with the optimum ascorbic acid content in carrier materials, intrastromally implanted cell/cryogel constructs exhibited better capability to enhance tissue matrix regeneration and transparency maintenance as well as to mitigate corneal damage in an alkali burn-induced animal model. 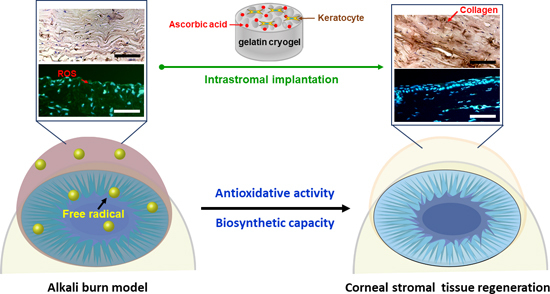 Altogether, their present findings give insight into the antioxidant molecule-mediated structure-property-function interrelationships in gelatin/ ascorbic acid cryogel materials for corneal stromal tissue engineering applications. Dr. Li-Jyuan Luo (Judy) completed her Ph.D. in Department of Chemical and Materials Engineering, Chung Gung University at 2018. Now, she is working as a post-doctoral fellow at Graduate Institute of Biomedical Engineering, Chang Gung University. 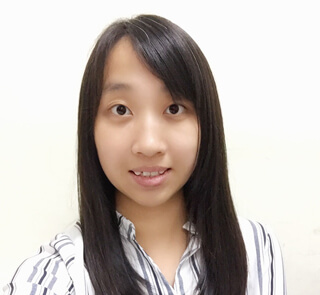 Her research interests mainly focus on ophthalmic biomaterials-related areas, particularly on biopolymer hydrogel carriers for tissue engineering and drug delivery applications. Primary research activities include multifunctional in situ gelling polymeric hydrogels for topical/intracameral drug administration in the treatment of dry eye syndrome and glaucoma as well as biomimetic polymeric membrane/cryogel systems as therapeutic cell scaffolds for the reconstruction of hemi-corneal tissues. She has published 12 international peer-review journal papers within specific biomaterial fields and received important awards such as “WBC2016-Écolede technologie supérieure Trainee Award” from 10th World Biomaterials Congress (Montreal, 2016), “Best Oral Presentation Award” in Frontiers from Biomedical Polymer Conference (Seoul, 2017), “Encouragement of Research Award” from International Union of Materials Research Society-International Conference of Advanced Materials (Kyoto, 2017), and “MoDeSt Society Grant” from 10th International Conference of Modification, Degradation and Stabilization of Polymers (Tokyo, 2018). 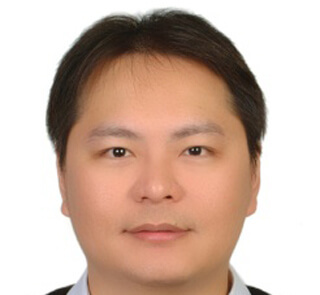 Dr. Jui-Yang Lai obtained his Ph.D. in Chemical Engineering from National Tsing Hua University, Taiwan. Since 2014, he is a Full Professor at Chang Gung University, Taiwan. Dr. Lai’s primary research activities are centered on the design and development of functional biomaterials, either from natural or synthetic sources, for ophthalmic use, particularly on tissue engineering, drug delivery, and nanomedicine. His major research projects involve ocular biocompatibility assessment, corneal/retinal cell construct fabrication, topical/intraocular pharmaceutical dosage formulation, and metallic/carbon-based nanotherapeutics evaluation. Dr. Lai has published ~80 SCI journal papers, being also a member of the editorial board of several international journals. He actively participates in the peer review process for scientific publications and receives “Acta Biomaterialia Outstanding Reviewer Award 2016” from Elsevier.